We aim to deliver the majority of items within 3 working days of receipt of the Customer order, most items will be dispatched on either the same or the following business day. Certain items may be delivered either directly from the manufacturer or be on extended delivery, if this is the case there will be a delivery notice and estimated delivery time included on the item description. 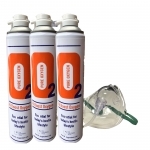 This can apply to oxygen cylinders and certain types of oxygen concentrator. Depending on the item ordered, we will deliver using either Royal Mail, Parcelforce, our own delivery or a specialist hazardous goods delivery Company. On occasion we may need to send you more than 1 delivery, this could be where some parts of an order are fulfilled directly from ourselves, and other parts are delivered directly from either a Manufacturer, or occasionally where some items ordered are out of stock or are sent from another location. Where this is likely to occur we will send you an email notification advising that this is the case. You will also be sent a delivery note that includes both items dispatched with the delivery, and items outstanding for further delivery.